The Medici villas are a series of rural building complexes near Florence which were owned by members of the Medici family between the 15th century and the 17th century. The villas were splendid residences, rich with works of art (Botticelli's "Spring" was painted for the villa in Castello), which were both excellent economic investments that were a source of constant income, and safe political centres, since they guaranteed the control of the territory of the Grand Duchy of Tuscany. Each member of the Medici family had his own estate as a place of pleasure and representation and, depending on the seasons, the Grand Duchy moved from one villa to another; for hunting at Pratolino and Cafaggiolo, and in the winter toward the sea in search of milder temperatures. 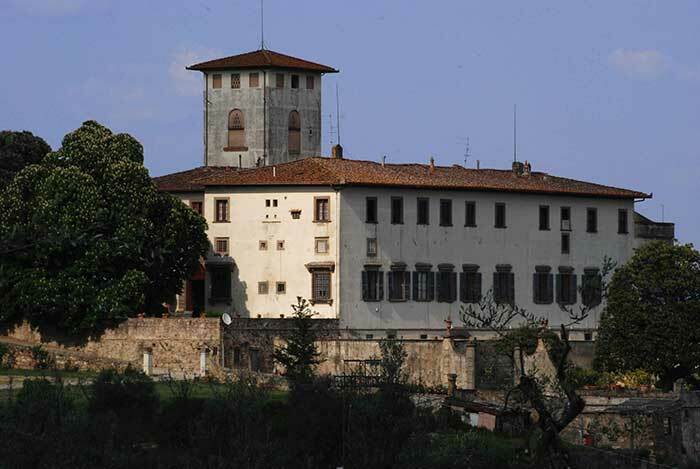 In 2013, the following Medici villas were added to UNESCO's World Heritage list. The twelve Medici villas and two pleasure gardens are Villa di Cafaggiolo, Villa del Trebbio, Villa di Careggi, Villa Medici di Fiesole, Villa di Castello, Villa di Poggio a Caiano, Villa di La Petraia, Villa di Cerreto Guidi, Palazzo di Saravezza, Villa La Magia, Villa di Artimino, Villa di Poggio Imperiale, Boboli Gardens and Pratolino Park. and the Villa Medici in Rome. Today the castle is a private property. Today the Villa is a private farm. The Villa is an architectonic masterpiece by Giuliano da Sangallo. Villa Poggio a Caiano is an interesting example of early Renaissance architecture that conserved noteworthy frescos of some of the most important Florentine paintings of the 16th century (Pontormo and Andrea del Sarto). In 1473 a ruined fortified house at Poggio a Caiano, called the Ambra, and land and a mill owned by Giovanni Rucellai, were bought by Lorenzo de' Medici. First, agricultural improvements were carried out, then in 1485 work started on the Medici Villa del Poggio, the "Villa on the Hill", to designs by Giuliano da Sangallo commissioned by Lorenzo. Building was begun around 1485 but was interrupted at Lorenzo's death in 1492. Work continued under pope Leo X, son of Lorenzo, and the villa was finally completed in the second half of the 16th century. The Salone, named after Leo X, is splendidly decorated with allegorical frescoes celebrating the Medici family, painted by Andrea del Sarto, Pontormo, Franciabigio and Alessandro Allori. In 1984, the villa became a National Museum and a major cycle of restoration began, concluding in 2007 with the opening to the public of the second floor, where a Museum of still-life painting was created, featuring large paintings by Bartolomeo Bimbi, as well as works from the Medici villas in Castello, Topaia, Ambrogiana and taken from storage. Opening hours: November – February 8.15am – 4.30pm; March and October 8.15am – 5.30pm; April - May and September 8.15am – 6.30pm; June – August 8.15am – 7.30pm. Closed on the 2nd and 3rd Monday of each month. Admission to the park and garden is free. The interior of the Villa can be visited on guided tours run by the security staff . Visitors can choose whether to visit the Monumental Apartments or the Still Life Museum. La Ferdinanda" Medici Villa is also known as the "villa of the 100 chimneys" due to the numerous chimneys that make it unique. Its spectacular magnificence is justified by the fact that it was the Medicean hunting residence inside the bandita (game reserve). The illustrious author of the this Villa was the Florentine, Bernardo Buontalenti. The Grand Dukes owned it until 1782, when it was sold to the Marquis Lorenzo Bartolomei. The Artimino estate is a 732 hectare estate just 24 kilometres from Florence. The property comprises the famous Medici Villa, "La Ferdinanda", which became a UNESCO World Heritage Site in 2013; the hotel "Paggeria Medicea" and the Artimino farm, dedicated to producing oil and wine, including the famous Carmignano DOCG and Chianti DOC wine. The Villa di Castello, in the hills near Florence, Tuscany, central Italy, was the country residence of Cosimo I de' Medici, Grand Duke of Tuscany (1519-1574). The gardens, filled with fountains, statuary, and a grotto, became famous throughout Europe. The villa also housed some of the great art treasures of Florence, including Sandro Botticelli's Renaissance masterpieces The Birth of Venus and Primavera. The gardens of the Villa had a profound influence upon the design of the Italian Renaissance garden and the later French formal garden. A five hundred meter avenue lined with trees leads to the front door of the Villa. The Villa is not opened to the public, but it is possible to visit the beautiful gardens, with citrus fruits and plants, Renaissance sculptures and the fascinating “Grotta of Animals”. Located just outside Florence, Villa La Petraia is one of the most enchanting Medici villas, with its outstanding country setting, sublime pictorial decorations and panoramic formal gardens. Originally an ancient fortified residence, which preserves its great tower, it was enlarged at the end of the 16th century to create the present villa with its beautifully designed terraced garden. The courtyard of the villa, which was roofed over in the 19th century, is decorated with frescoes by Volterrano and Cosimo Daddi. The famous bronze statue of Venus/Florence by Giambologna, which originally stood above the fountain in the garden of the Medici Villa of Castello, is now exhibited inside. The Medici family purchased the villa in the middle of the 16th century. Around 1566-1568, Cosimo I had the complex restructured, and gave it to his son Ferdinando I (first cardinal, and later Grand Duke) who completed the works. The garden in front of the villa, done on a project by Tribolo, develops on three superimposed terraces, created by means of major infill works. During the restructuring works conducted by Tribolo, the aqueduct structures, which from the springs of Valcenni brought water to La Pietraia, were also redone. Despite these works, the presence of water in the garden was not as impressive as at Castello. Water served exclusively to irrigate the areas of the garden planted with fruit trees and officinal plants. In the first half of the 19th century, the romantic park was created on a project by Bohemian architect Joseph Frietsch. The function of the park is to connect La Pietraia and Castello by means of an alley, from which depart walks and footpaths, that climb up the hill, skirting brooks and lakes. The park abounds in holm-oaks and cypress trees, and also has several specimens of red oak and various types of pine trees. The sundial on the facade, in part painted and in part carved on a plaster support, still integral and functioning, was made shortly before the mid 18th century. Inhabited until the end of the 19th century, the Petraia complex is today public property and open to visits. The villa can also be associated with the name of Galileo Galilei. It was precisely from La Pietraia that Lodovico Incontri sent Galileo «two flasks of sour cherry wine from La Pietraia», inviting him to inform His Highness should he desire others. On May 9, 1638, Galileo declared he was willing to visit the Grand Duke who was staying at the villa. June – August 8.15am – 7.30pm. The Medici Villas have maintained their original characteristics unchanged, expressing the particular measurement and refined taste of the Florentine culture during both the Renaissance and Baroque periods. The Villa Medici in Fiesole, one of the oldest Renaissance residences with a garden, is also one of the best preserved, but at the same time is also one of the least well known. While most of the villas dating back to the same period, such as Cafaggiolo and Trebbio, stand at the centre of farming concerns, this villa had no connections at all with agricultural life. The Villa Medici was built during the mid fifteenth century when Cosimo hired Michellozzo Di Bartolommeo to design the Villa for his son Giovanni Medici. Intended to be a setting for intellectual life rather than a working Villa, Villa Medici was constructed to be a demonstration of aesthetic and ideological values. 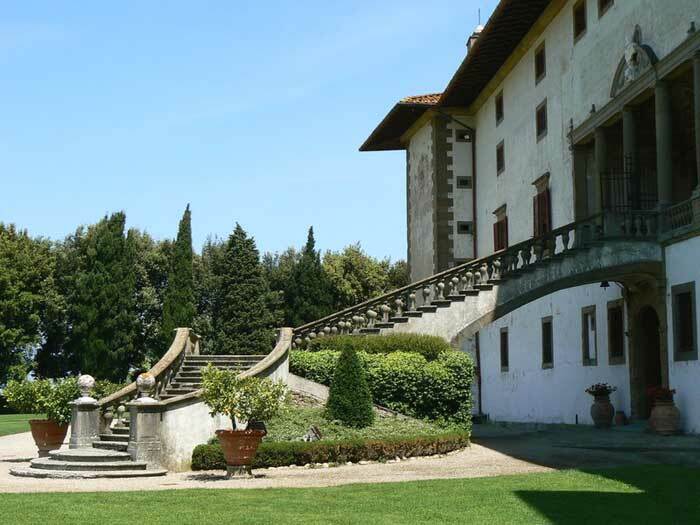 Villa Fiesole was designed by Michelozzo (1458-1461) and it still appears in great conditions. The residence is gently placed on the hills surrounding Florence and the panoramic view is outstanding. The geographical position of the villa on gently sloping land suggested the layout of the garden on three terraces. The first of these, at the end of an avenue lined with cypress trees that runs underneath a holm-oak wood, has large rectangular lawns with potted lemon trees. The villa's piano nobile looks out onto this part of the garden. The second terrace is overlooked by the rear of the building and is reached by an indoor staircase. This, the least heavily altered part of the garden, has flower beds lined with box hedges with a large fountain in the centre, and is laid out in the shade of large magnolia trees. The third terrace, created between 1911 and 1923 by Cecil Pinsent and Geoffrey Scott is aligned longitudinally with the first, but is 11-12 m lower down. It is laid out in the Italian style, with a fine pergola positioned mid-way between the two levels. Below the lemon garden is an unpaved walk which leads to the pergola which runs the length of another retaining wall. The pergola walks leads to the western terrace and the giardino segreto, or "secret garden." Villa Corsini di Mezzomonte, situated in the countryside near Impruneta, which belonged to the Buondelmontis and the Medicis, before being acquired by the Corsini family. Address: Via Imprunetana per Pozzolatico 116, Impruneta, Firenze l field. Villa La Medicea, an old Renaissance villa, is also part of the estate of Villa di Mezzomonte which belonged to the Medici family before passing to the Corsini family. Converted into the Renaissance style by Lorenzo Il Magnifico, the estate has welcomed famous people and hosted important events over the centuries. Villa Demidoff is the current name of the ancient Medicean Paggeria of Pratolino. Located on the Florentine hills along the Via Bolognese heading into the Mugello valley, the estate in Pratolino was bought by Francesco I de' Medici in 1568, who entrusted Buontalenti with the task of transforming it into a villa. Legend has it that Francesco bought it as a gift for his second wife Bianca Cappello with the idea of turning it into a fairy-tale property. The Park of Pratolino was the largest of the estates of the Medici family, as shown in a detailed view of the Villa by Giusto Utens. Left in ruins by Ferdinand III and Leopold II of Lorraine, the villa was demolished and the park landscaped into an English style garden. Sometime later it was bought by Prince Paolo Demidoff who had the pages’ quarters turned into the existing villa in 1872. On August 4, 1981, the complex was bought by the Province of Florence for public use. The park is open to the public during the months of March and October Sundays and holidays from 10 to 18. From April to the end of September, Thursday, Friday, Saturday and Sunday from 10 to 19.30. The Villa Medici at Careggi nestles behind a high wall and is famed as the place where Cosimo de' Medici (1389-1464) assembled his Platonic academy. Cosimo, the most celebrated of all the Medicis, died here in 1464. The first to mention Michelozzo’s work on the villa at Careggi was Giorgio Vasari who, after describing the Villa del Trebbio, wrote: “E similmente, lontano da Firenze due miglia, fece il palazzo della villa di Careggi, dove Michelozzo condusse l’acqua per la fonte che al presente si vede”. As we enter the Villa we first see the Cortile and loggia which is certainly the fulcrum of Michelozzo’s design. We are immediately struck by the unusual, trapezoidal shape of the courtyard which is congruent with the path of the road (in fact, at the time the work was being done, the main road was tangential to the entrance). The two lateral wings of the west façade are also attributed to Michelozzo. They are lower than the central structure and project towards the garden. On the ground floor there are two loggias with three arches supported by composite style capitals and columns which are similar to those in the internal courtyard. Lorenzo the Magnificent was born at the Careggi villa in 1448, and after the death of Cosimo the Elder (1464) he became the head of the family. Careggi was his favorite residence and he transformed it into a center of culture and the arts by establishing the Neoplatonic Academy. Following the death of Lorenzo the Magnificent, the fall of Savonarola and the banishment of the Medicis from Florence, most of their lands and buildings were confiscated. Although this was not the fate of the Villa at Careggi, it changed hands through inheritance several times. Finally it was inherited by the Duke Alessandro in 1534 and was remodeled again. 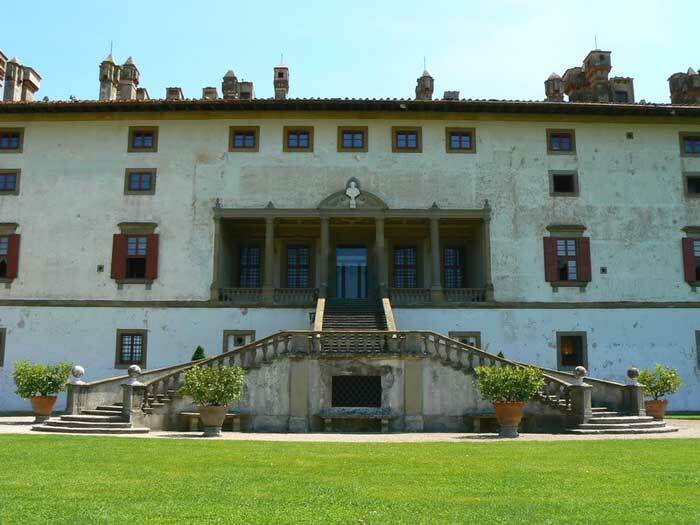 When the Grand Duke Cosimo I became the proprietor, the villa lost its former splendor: he preferred the Villa del Trebbio to such an extent that in 1569 he gave the entire Careggi estate to his son Pietro. The Grand Duke Ferdinando died in 1609 and the villa went to Prince Carlo who, after being made a cardinal in 1615, undertook an enormous project to remodel the villa and the gardens. The Medici inventory of 1492 records the Entombment of Christ hanging in the Medici villa in Careggi. The figure of Nicodemus, dressed in expensive clothing and gazing out towards the spectator, has been identified as a portrait of Cosimo. 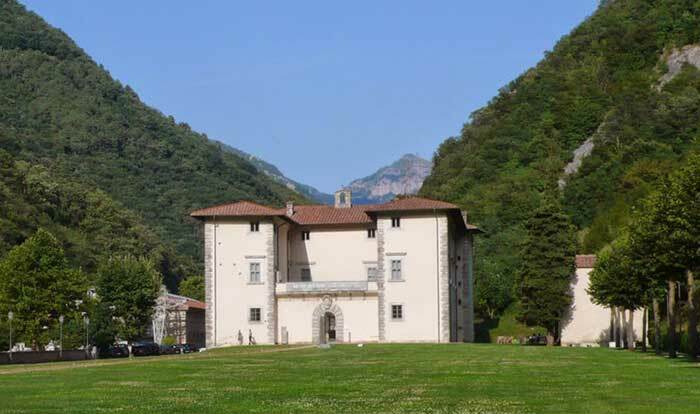 The villa is situated near to the Fucecchio Marshes, a humid area rich in fauna. It was built in 1556 by Cosimo I as a fortified hunting lodge. The building, which has a double ramp in brick leading up to the entrance, is attributed to the architect Buontalenti. The Medici Villa of Cerreto Guidi and the Historical Hunting and Territorial Museum" fa parte del Polo Museale Fiorentinon. The palace of Seravezza is a residence of the Medici family. On order of Cosimo I de’ Medici, it was built between 1560 and 1564 by Bartolomeo Ammannati or, as recently argued for the resemblance of several architectural elements with the Villa of Artimino, by a young Bernardo Buontalenti. The building was erected in an area particularly important for extracting minerals and quarrying marble from Monte Altissimo. The building presents itself as a fortified palace and was to serve as a resting place for the Duke when he came to visit the caves. The use of marble in the cornices of the windows should not be considered a sign of splendour as there was an abundance of marble in Seravezza. Lady Sybil's daughter and heiress, Iris Origo, later employed Cecil Pinsent for the development of the garden at La Foce, her property in the Crete Senesi near Montepulciano. Iris Origo (1902-1988), the Marchesa Origo, was an Anglo-Irish-American writer, who devoted much of her life to the improvement of the Tuscan estate at La Foce that she purchased with her husband in the 1920s. Following a decision by the Tuscan Government, this represents the first step towards the promotion of international activities entirely dedicated to landscape issues and concerning the implementation of the above-mentioned Convention at Villa Careggi. Podere Santa Pia is a peaceful retreat, perfect for relaxing and enjoying the splendor of the Tuscany countryside. Enjoy the exquisite art, museums and churches in the nearby cities, then relish the cuisine and epic countryside. Podere Santa Pia highlights the best of the quintessential Italian region. One of the world’s most beautiful and large (45 thousand square meters) gardens stretches behind Palazzo Pitti: the Boboli Gardens. It was begun in 1550 to plans by Tribolo, the inventor of the Italian garden when Cosimo I and his wife, Eleonora di Toledo purchased the palace. Over the coming centuries the gardens were expanded and transformed by many architects (Vasari, Ammannati, Buontalenti, A. and G. Parigi, Zanobi del Rosso, Paoletti and Poccianti). The eighteenth century stone amphitheater with the Egyptian obelisk in the middle was the setting for many famous performances in the past. In addition to comprising an ideal extension of the palace courtyard, it is the perfect starting place for various strolls along the tree-lined paths and avenues, many of which are flanked by ancient or sixteenth-seventeenth century statues. There are many large pools (the Trident Fountain with the statue of Neptune by S. Lorenzi; the Isolotto with Giambologna’s statue of Oceanus in the middle). And there are many grottoes, the most outstanding of which is Buontalenti’s Mannerist oeuvre with sculptures by Giambologna and copies of Michelangelo’s Prisoners. Much work was done in the eighteenth-nineteenth centuries: it included broadening the paths for carriages (this led to the destruction of the old Maze and the area for game) and the construction of new buildings such as the Kaffehaus, the Limonaia, the Palazzina della Meridiana (home of the Costume Gallery) and the Casino del Cavaliere (which houses the Porcelain Museum). The amazing variety of plants, the extraordinary wealth of sculptures, architectural settings and views of the city and its surroundings make a visit to the garden a unique experience for the soul and the senses. The Medici Villas form a totally new system of residences built by the Medici family outside the walls of Florence, in the centre of vast farming properties. From the 15th to the early 18th century, the Medici family played a decisive political role in the Tuscan territory, adding to their city homes, more specifically connected with the exercise of their power, these places for recreation and hunting which, thanks to the Medici patronage, became meeting places for literati, philosophers, and artists. The group of villas was built during the phase of the family's political success, while the city of Florence was becoming the heart of the formation, and later the expansion throughout Europe, of the Renaissance culture. Originating as the transformation of ancient castles and pre-existing villas, down through the centuries the country residences of the Medici were the settings of important events connected with both the historic-political and the cultural affairs of the city of Florence. Characterized by a general conception based on a clear relationship between the building and the park, surrounded by vast gardens, they were a decisive element in launching, for both the conception of architecture and the arrangement of the surrounding greenery, the features that later became typical in the territorial organization around Florence and throughout Tuscany, based on a Renaissance-style rational arrangement. The language of the Medici architects, ordered by the Grand Dukes themselves, is inspired by rigor and elegance and dominated by simplicity and austerity, according to a precise "State architecture" that made the figure of the Prince omnipresent throughout the entire Grand Duchy. Generally speaking, the villa consists of a compact building whose façade stands out for its calculated sobriety with few decorative elements. Large porticoes open the building up toward the surrounding garden and landscape. The garden, mainly organized into descending terraces, is a fundamental element of the villa, as can still clearly be seen in the Medici complex of Castello, commissioned by Cosimo I from Niccolò Tribolo, who designed it on the basis of the canons and descriptions of Leon Battista Alberti, and considered by Vasari as one of the "richest gardens in Europe". Apart from the private ("secret") places for the family, the gardens of the villas are organized scenographically to glorify the entire court and astound guests and visitors. They are a measured concession to that "French" style that found little application in Tuscany: the culture of the control of space was too strong and ingrained. The interiors of the buildings are enriched with important cycles of murals, celebrating the Medici family. The Villa of Poggio a Caiano constitutes the oldest attempt to bring the classical suburban villa back to life, on the basis of the writings of Pliny and Vitruvius; during the Renaissance, it became an actual country home, even though the solution of the large central atrium with coffered vaulted ceiling derives more specifically from a study of the Roman baths. The edifice was built over the remains of an ancient Cancellieri fortress which had belonged to the Strozzi family and then to Giovanni Rucellai, purchased in 1474 by Lorenzo the Magnificent, who engaged Giuliano da Sangallo to rebuild it completely. The villa is a pure geometric volume supported by a porticoed base. The marked accent of rustic simplicity becomes an expression of a subtler, more sophisticated elegance thanks to the insertion of the tympanum. The general conception of the complex reinvents the layout of the Tuscan villa, no longer revolving around a closed courtyard, as in medieval buildings, but around a large hall or reception room ("salone") that distributes the main rooms, arranged along the longitudinal axis of the building. This centrality of the "Salone" is exalted by the presence of the scenographic pictorial cycle, celebrating the Medici family, painted by Franciabigio, Andrea del Sarto, Pontormo, and Alessandro Allori. During the subsequent centuries, other work enriched and transformed the complex which, in the 19th century, became the vacation home of the Savoy family. The Villa della Petraia dates from the late 16th century, when the Medici, after purchasing it from the Strozzi, renovated and enlarged the ancient castle, which already existed in the 14th century. The general Buontalenti-style architectural rearrangement was embellished by the various owners with decorative elements and murals. The frescoes of the courtyard, by Cosimo Daddi and Volterrano, date from the time of the Medici, the ground-floor chapel is from the period of the House of Lorraine, and the iron and glass roofing of the courtyard, its arrangement as a large party room, and, more in general, the interior decorating of the villa were added by the Savoy, who brought in furniture from various other residences they owned in Turin, Modena, Lucca, and Parma. The vast garden surrounding the villa also reflects a similar historic stratification. Over the original late-16th-century general plan with overlapping terraces created with great embankments, were placed the 19th-century landscaping of the so-called "Piano della Figurina", adorned with the Fiorenza Fountain (Niccolò Tribolo and Giambologna), and the romantic English-style park on the north side, created in the early 1800s. Formerly the favourite residence of Cosimo de' Medici's mother, the Villa di Castello was renovated and decorated by Cosimo himself immediately after his election as the city's Grand Duke (1537). Impressive projects to enlarge the villa and landscape the gardens were promptly launched, in order to celebrate, through the various decorative elements, his astonishingly quick rise to power and his role as an ensurer of the peace and prosperity achieved. The garden, the best preserved specimen of an "Italian style garden", in accordance with Leon Battista Alberti's canons and descriptions, is organized along a central axis on three descending terraces, of which the first may be considered an external continuation of the Villa. A magnificent plumbing system supplied water to the numerous fountains. Among the decorative elements, stand-outs are the Fountain of Hercules and Antaeus, so called after the bronze group by Bartolomeo Ammannati, which decorates its top, and the Cave of the Animals or of the Flood, completed by Vasari, which celebrates, in a perfect simulation of a natural cave in which sculpture groups of animals in polychrome marbles are placed, the pacification of the living universe by Cosimo. Worthy of note is the garden of medicinal herbs, a true gem of its kind, and the excellent collection of citrus plants, including some of the most important in the world. The Villa di Careggi, the Medici's favourite residence in the 15th century, combines monumental value with the historic value of the place where Lorenzo the Magnificent devoted himself to his studies, surrounded by the philosophers and literati of the Platonic Academy. Purchased by the Medici, it was renovated and enlarged in around the mid-15th century, after a design attributed to Michelozzo di Bartolomeo. It is from this time that the building's typical characteristic of a compact block, with unifying elements in the crenellated top overhanging stone corbels and the projecting volumes of the two loggias to the west, dates. The decorative scheme of the interiors mainly dates from the early decades of the 17th century, when, on orders from Prince Carlo de' Medici, who became a cardinal in 1615, both the villa and the garden were transformed under the direction of Giulio Parigi, an engineer of the Medici court. Particularly fine is the "grotticina", below the first floor "salone", with the fountain decorated with sponges and the majolica-tiled floor. The vast garden surrounding the edifice reflects both the 17th-century changes and those in the romantic vein, made in the late 19th century, when the villa became the place commemorating the legend of Lorenzo the Magnificent. The Villa di Cerreto Guidi, located not far from Vinci on the slopes of Monte Albano, was built in around 1565 by Cosimo I, and replaced the ruins of the ancient castle of the Guidi counts. A hunting residence and rural administration centre, as well as a convenient stopover point for the transfers of the Grand Duke's court from Florence to Pisa and the Maremma region, the building, on a rectangular plan, is characterized by simple, straight architectural forms, enhanced by majestic terracotta and stone ramps, traditionally attributed to Buontalenti, which form a sort of scenographic base. The building, whose interior is characterized by a 19th-century decorative scheme, is enriched in the back by a garden, which was also probably redesigned in the last century and, in the front, at the top of the ramps, a large area affording a view of an extraordinary panorama. The imposing size of the villa, which holds an interesting series of Medici family portraits, stands out as an element that characterizes the surrounding landscape. The Medici Villas have maintained their original characteristics unchanged, expressing the particular measurement and refined taste of the Florentine culture during both the Renaissance and Baroque periods. All the monuments benefit from legal protection through national legislative provisions (Legislative Decree no. 42/2004, "Code for cultural assets and landscape"), regional and municipal administrative measures, and management mechanism measures that ensure their preservation. This complex of residences is comparable only to the most distinguished examples of aristocratic residences surrounded by gardens ordered by the most important Italian families of the Renaissance - such as the Gonzaga in Mantua and the Este in Ferrara - in relation to the political and cultural function they had, as an extension throughout the territory of the court life, as well as to the Palladian Villas and those of the papal nobility in Latium. Compared to the examples mentioned, the Medici Villas, which were created through a reutilization of pre-existing structures, stand out for their characteristic as a system of control and supervision over the territory, combined with their productive functions and use as places for artistic expression, representation, and recreation for the Medici family.